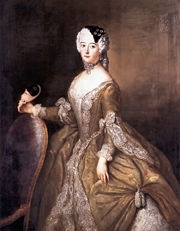 Luise Ulrike Prinzessin von Preußen was born on 24 July 1720.3 She was the daughter of Friedrich Wilhelm I König in Preußen and Sophia Dorothea Hanover, Princess of Great Britain. 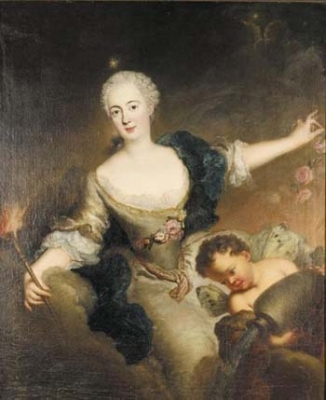 She married Adolf Frederik I von Holstein-Gottorp, King of Sweden, son of Christian August Herzog von Holstein-Gottorp and Albertine Markgräfin von Baden-Durlach, on 29 August 1744 at Drottningholm, SwedenG.3 She died on 2 July 1782 at age 61 at Swartsjö im Mälarsee, Sweden.3 She was also reported to have died on 16 July 1782 at Swartsjö im Mälarsee, Sweden. Luise Ulrike Prinzessin von Preußen usually went by her middle name of Ulrike. She gained the title of Prinzessin von Preußen.1 After her marriage, Luise Ulrike Prinzessin von Preußen was styled as Queen Ulrike of Sweden in 1751. [S12] C. Arnold McNaughton, The Book of Kings: A Royal Genealogy, in 3 volumes (London, U.K.: Garnstone Press, 1973), volume 1, page 44. Hereinafter cited as The Book of Kings. [S12] C. Arnold McNaughton, The Book of Kings, volume 1, page 45. [S12] C. Arnold McNaughton, The Book of Kings: A Royal Genealogy, in 3 volumes (London, U.K.: Garnstone Press, 1973), volume 1, page 45. Hereinafter cited as The Book of Kings. [S12] C. Arnold McNaughton, The Book of Kings, volume 1, page 73. [S12] C. Arnold McNaughton, The Book of Kings: A Royal Genealogy, in 3 volumes (London, U.K.: Garnstone Press, 1973), volume 1, page 74. Hereinafter cited as The Book of Kings. William de Bohun, 1st Earl of Northampton was born circa 1311.1 He was the son of Humphrey de Bohun, 4th Earl of Hereford and Lady Elizabeth Plantagenet. He married Elizabeth de Badlesmere, daughter of Bartholomew de Badlesmere, 1st Baron Badlesmere and Margaret de Clare. He died on 16 September 1360. He gained the title of 1st Earl of Northampton in 1337. Elisabeth Henriette Prinzessin von Hessen-Kassel was born on 8 November 1661 at Cassel, GermanyG. She was the daughter of Wilhelm VI Landgraf von Hessen-Kassel and Hedwig Sohpie Prinzessin von Brandenburg.1 She married Friedrich I König in Preußen, son of Friedrich Wilhelm Kurfürst von Brandenburg and Louise Henriëtte von Nassau-Dillenburg, Princess of Orange, on 23 August 1679 at Potsdam, Brandenburg, GermanyG.1 She died on 27 June 1683 at age 21 at Coln au der Spree, GermanyG. Luise Dorothea Sophie Prinzessin von Preußen was born on 29 September 1680. She was the daughter of Friedrich I König in Preußen and Elisabeth Henriette Prinzessin von Hessen-Kassel. She married Friedrich I von Hessen-Kassel, King of Sweden, son of Karl I Landgraf von Hessen-Kassel and Marie Amalie Prinzessin von Kurland, on 31 May 1700. She died on 23 December 1705 at age 25. 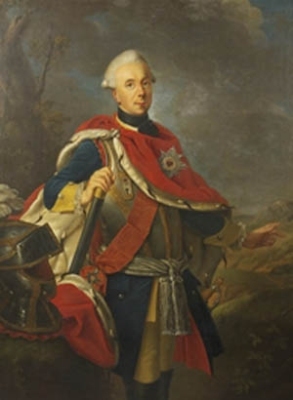 Friedrich I von Hessen-Kassel, King of Sweden was born on 28 April 1676. 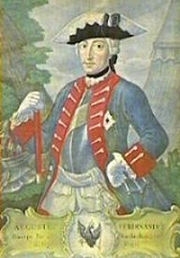 He was the son of Karl I Landgraf von Hessen-Kassel and Marie Amalie Prinzessin von Kurland.3 He married, firstly, Luise Dorothea Sophie Prinzessin von Preußen, daughter of Friedrich I König in Preußen and Elisabeth Henriette Prinzessin von Hessen-Kassel, on 31 May 1700. 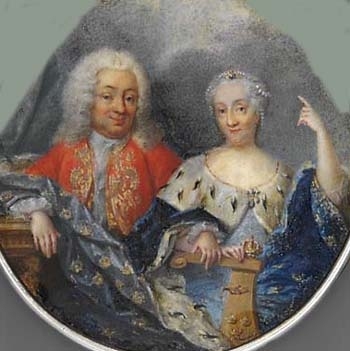 He married, secondly, Ulrike Eleonore von Holstein-Gottorp, Queen of Sweden, daughter of Carl XI von Holstein-Gottorp, King of Sweden and Ulrike Eleanore Oldenburg, Princess of Denmark, on 4 April 1715.3 He died on 5 April 1751 at age 74 at Stockholm, SwedenG. [S38] John Morby, Dynasties of the World, page 135.